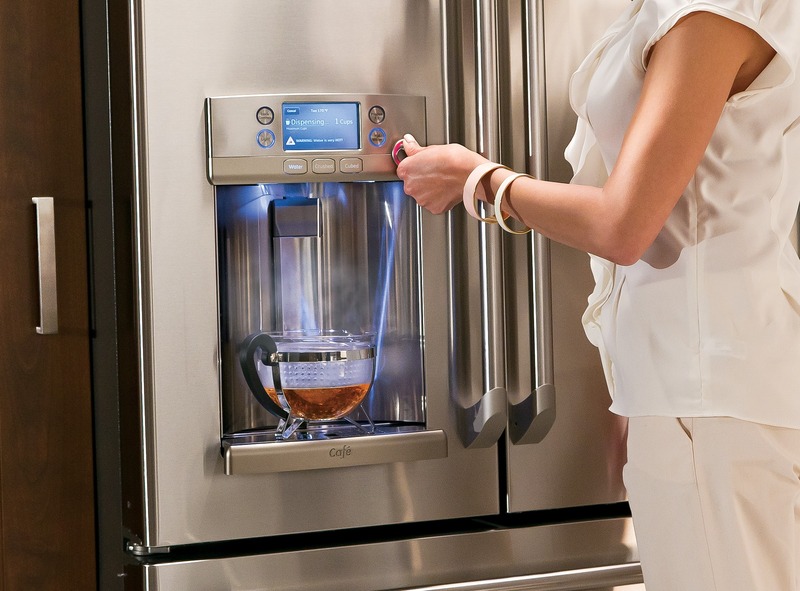 LOUISVILLE, Ky., — April 9, 2013 — (NYSE: GE) — GE is heating up the world of refrigerators with a hot water dispenser available on its new line of Café™ French door models. A custom setting allows the consumer to select a temperature from 90 to 185 degrees Fahrenheit, or select one of four pre-programmed settings, which include 90 degrees for warm, 150 degrees for cocoa, 170 degrees for tea, and 185 degrees for soup. With the Café's hot water dispenser, consumers can be assured they are quickly getting an accurate temperature for their filtered water. With the Café’s hot water dispenser, consumers can be assured they are quickly getting an accurate temperature for their filtered water. 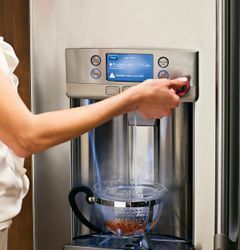 After studying how consumers interact with their refrigerators and kitchens, research revealed many use hot water daily. Some of the most common usages include preparing a cup of oatmeal, making tea, or fixing hot chocolate. With the custom and pre-programmed settings, consumers can select the perfect temperature for whatever they crave. 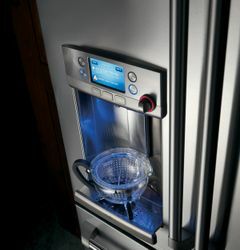 Adding hot water to the refrigerator was a design challenge that GE’s ice and water engineering team tackled head on. The team figured out how to keep the interior temperatures at the ideal settings while restricting the energy consumption to achieve ENERGY STAR® status. From there, GE’s engineers created a W-shaped heating element that uses a tube to feed the coldest water from the bottom while pushing the hottest water out from the top. Once the nature of the design began firming up, the team delved into consistency and reliability. They employed two thermometers to confirm accurate temperatures and verified the unit could not dispense boiling water. To use the hot water dispenser, a consumer must push in the dedicated knob and turn it counterclockwise. The high-tech design of the hot water dispenser is patent pending. 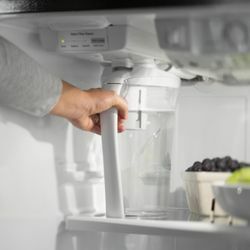 “The hot water dispenser will be a feature that once consumers have it, they’ll never want to live without it,” said John Boyd, marketing manager for refrigeration for GE Appliances. Pharmaceutical Filter: All of the new GE French door refrigerators feature the most advanced water filtration system in the industry. The system has been tested and certified by an independent third party to remove 98 percent of five trace pharmaceuticals, such as ibuprofen (a painkiller) and progesterone (a hormone). * In addition, the filter is located in the door for easy replacement, while also freeing up valuable space in the refrigerator. Temperature-Controlled Drawer: A full-width, adjustable temperature-controlled drawer helps consumers store specific meat, beverage, produce, cheese and citrus foods at optimal storage temperatures, from 32 to 40 degrees Fahrenheit. Colored LED lights in the drawer—red, green, blue, aqua and purple—are visual cues of the temperature chosen. Odor Filter: A new odor filter is designed to allow the consumer—at the touch of a button—to reduce unwanted odors within the fresh food section. TwinChill™ Evaporators: The French door refrigerators also feature TwinChill™ evaporators, which separate airflow and climates in the fresh food and freezer sections to help maintain temperature and humidity levels to keep foods fresh. The separation of the air limits the amount of humidity in the freezer, reducing freezer burn while keeping freezer odors from mixing with refrigerator odors. 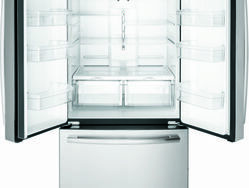 Convenient Storage Features: For optimal storage, the refrigerators feature a drop-down egg tray, door storage for gallon-sized products and adjustable shelves. The freezer features three freezer baskets and a space-saving icemaker in the door that frees up room in the refrigerator. †Users should follow manufacturers’ recommended instructions for baby formula. GE always encourages you to test the temperature of the bottle of formula before giving it to a baby. 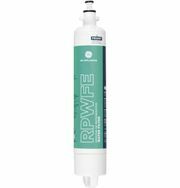 *The pharmaceuticals and other substances removed or reduced by this filter are not necessarily in any given water supply. ‡ Retailers set their own prices. The hot water dispenser on the GE Café French door refrigerator lets consumers accurately choose the perfect temperature or select one of four pre-programmed settings. With the custom and pre-programmed settings, consumers can select the perfect temperature, simplifying food and drink preparation. 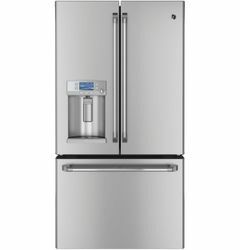 The 29-cubic-foot GE Café French Door refrigerator is the first refrigerator in the industry that can heat 10 ounces of water in minutes. 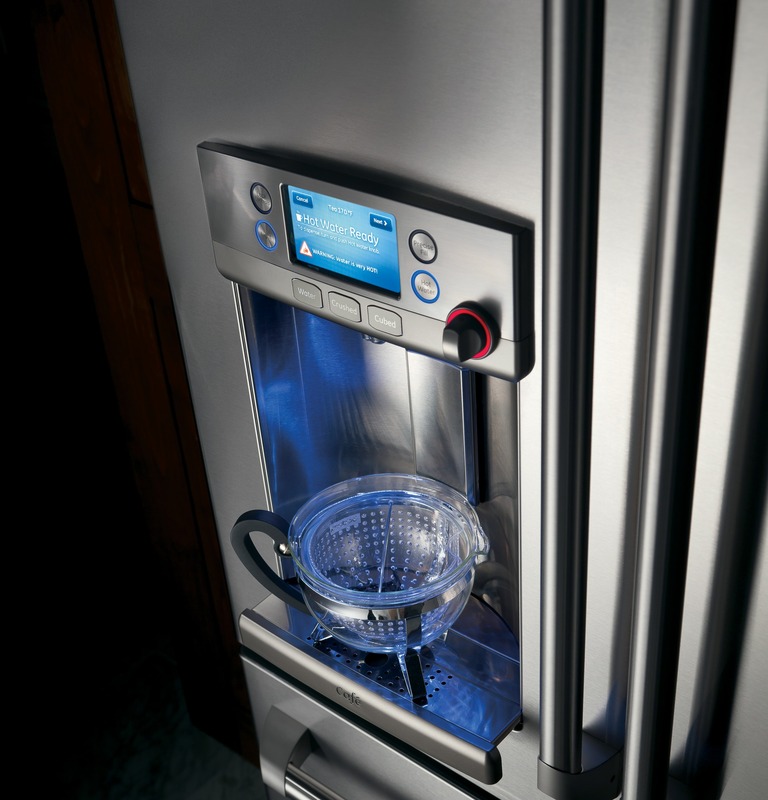 In addition to hot water, the refrigerator offers a variety of features designed to optimize the enjoyment of food and beverages. The 29-cubic-foot GE Café French door refrigerator is the first refrigerator in the industry that can heat 10 ounces of water in minutes – ideal for steeping delicate, white tea or preparing warm, filtered water for baby formula. 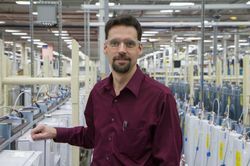 Rob Lewis, lead design engineer, masterminded the GE Café’s ability to dispense hot water, the first refrigerator in the industry to offer this convenient feature. Tea anyone? 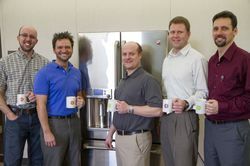 From left to right: GE engineers Corey Sweatt, Stew Keeling, Jeff Mellinger, Russ Fallon and Rob Lewis sip hot tea steeped using water from the Café’s hot water dispenser. The team successfully developed a hot water dispenser that delivers accurate temperatures, heightening the tea experience. Teas are sensitive to temperature and their flavor can be destroyed if the water is too hot or too cold. See how the full-width, adjustable temperature-controlled drawer helps consumers store specific at optimal storage temperatures. Colored LED lights in the drawer— red, green, blue, aqua and purple—are visual cues of the temperature chosen. 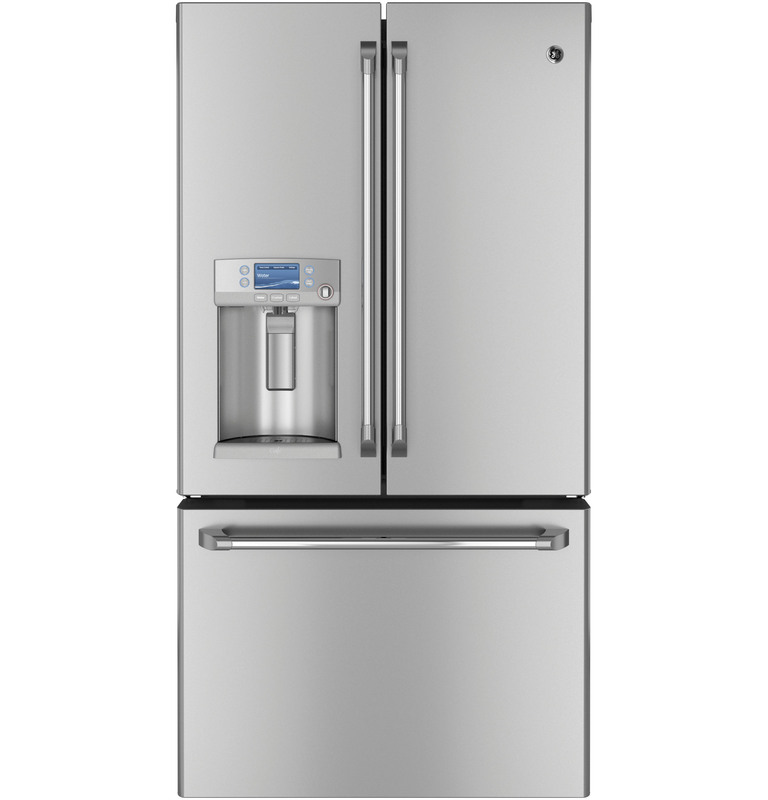 The Café French door refrigerator serves up style, performance and convenience. Watch how the new odor filter is designed to allow the consumer - at the touch of a button - to reduce unwanted odors within the fresh food section. 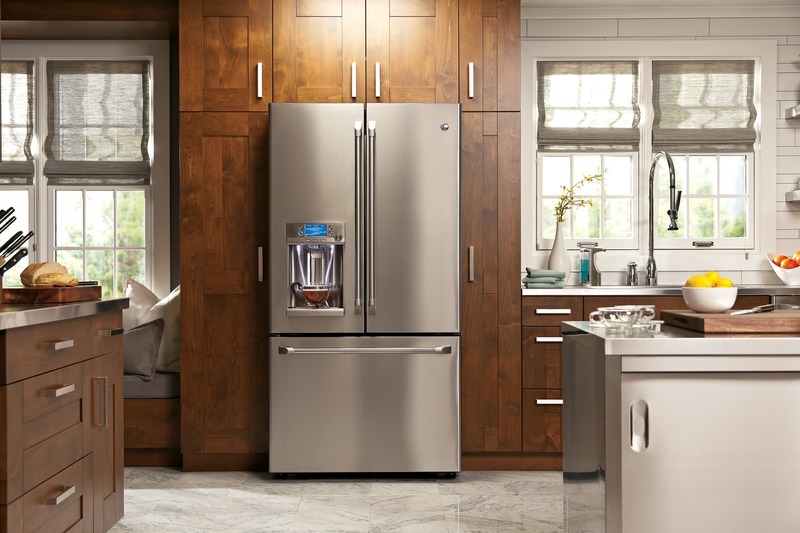 The new GE Café French door refrigerator offers the first-of-its-kind hot water feature to accurately choose the perfect temperature or select one of four pre-programmed settings. GE’s product team discusses the innovative features in the new GE Café French door refrigerator. Using the hot water feature on the GE Cafe™ French door refrigerator is wonderfully easy.